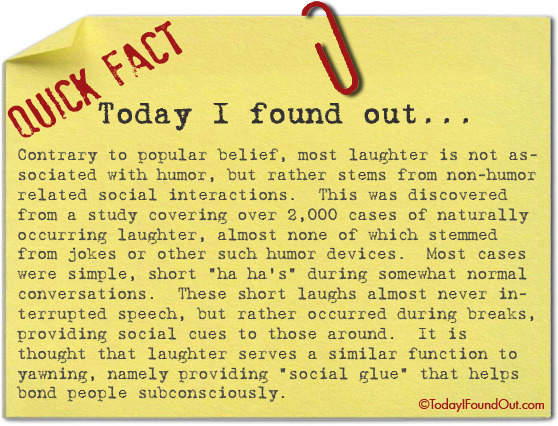 Contrary to popular belief, most laughter is not associated with humor, but rather stems from non-humor related social interactions. This was discovered from a study covering over 2,000 cases of naturally occurring laughter, almost none of which stemmed from jokes or other such humor devices. Most cases were simple, short “ha ha’s” during somewhat normal conversations. These short laughs almost never interrupted speech, but rather occurred during breaks, providing social cues to those around. It is thought that laughter serves a similar function to yawning, namely providing “social glue” that helps bond people subconsciously.